There has been a troubling resurgence of violence and threats of violence in the Cabañas region of El Salvador, where gold mining companies want to open mines. Those mining plans have been blocked by the Salvadoran government and a strong environmental movement. In 2009, three anti-mining activists were murdered in Cabañas. The police eventually arrested and convicted several people for the crimes, blaming the killings on gangs and a family feud. The victims' role as leaders of the anti-mining movement has been discounted by the authorities as a motive. But members of the activist community have continued to call on the police and prosecutors to pursue the intellectual authors of the crimes. Salvadoran blogger Omar Nieto, who writes at El Salvador's longest-running blog Hunnapuh, has begun writing some of his posts for translation into English at Global Voices. The current Catholic Archbishop of El Salvador, José Luis Escobar Alas, stated that although the ceasefire was a “blessing from God,” Salvadorans had still not found peace, but it was not too late to achieve it. Environmentalists robbed again. Members of CEICOM, which has taken an active role against mining activities in El Salvador have been robbed again as they were on their way to an environmental action. As in two previous robberies, the activists and journalists who accompanied them were robbed of laptop computers, video equipment and more. They have issued a renewed call for investigation. Schools open without teacher strike. Despite talk of a teacher strike, public schools opened on schedule throughout El Salvador today. For five days now, union employees of El Salvador's court system have been on strike. As a consequence, more than a thousand court hearings have been cancelled, bodies have gone unidentified in the forensic medicine office, and more than 87 prisoners have been released for failure to have an initial hearing within 72 hours of being arrested.. The unions are demanding raises of between 100 and 150 dollars per month for their members, but court officials state there is no available money to grant the raises. Court officials have also been blasting union leaders who officials say receive a salary but do not perform any work. La Prensa Grafica is reporting that union leaders receive multiple fringe benefits and also manage to get many relatives placed on the court system payroll as well. “Central America is entering an extraordinarily critical phase” in which its peace and security are threatened by “the onslaught of the drug-trafficking organisations”, an official from the International Narcotics Control Board, a United Nations agency, warned this month. At least 18 people were injured when an inter-city bus flipped over on a highway in El Salvador when the driver became distracted, the highway patrol said. The accident occurred Saturday on the highway that links San Salvador and the eastern city of Usulutan. SAN SALVADOR – A total of 1,107 people lost their lives in traffic accidents in El Salvador during 2010, according to figures compiled by the police, who reported 19,000 road accidents in total, an 11 percent increase compared with 2009, the Diario de Hoy newspaper reported Sunday. According to recent studies like the Economic Commission for Latin America and the Caribbean (ECLAC), El Salvador will be the most water-stressed country in Central America in the future. Population growth and climate change in the Central America region are driving this dire prediction. Water demand is expected to grow by 300 percent by 2050 in the region. To compound the problem the availability of renewable water could fall from current levels by 63 percent. The study “The Economics of Climate Change in Central America: 2010” shows that El Salvador will be most negatively effected followed by Honduras and Nicaragua. El Salvador is also the most deforested country in Latin America. 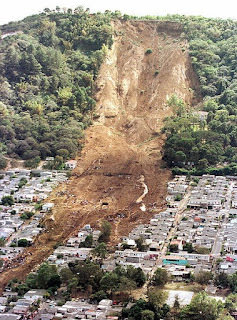 Today is the tenth anniversary of the first of two devastating earthquakes which hit El Salvador in 2001. That quake registered 7.6 on the Richter scale. Exactly one month later, on February 13, another earthquake would cause more damage. Between those two, the damage was enormous: 1,259 deaths, 9,000 injuries and 1.6 million homeless victims in a country with a population of approximately six million. In January 2001, El Salvador began using the US dollar as its official currency. The former national currency, the Colón, was gradually replaced with the US dollar as the money of the land. The administration of president Francisco Flores promoted the change to the greenback as a way to keep interest rates low, to control inflation, and to encourage foreign investment. It would be fair to say that the move to the dollar has never been popular among the ordinary people of El Salvador. The symbolism of giving up a country's national currency was obvious. And many felt that stores used the change as a pretext to increase prices and cheat the little person. My annual roundup of the top stories of the past year. Record rains cause floods and damage crops. Rains from tropical storms Agatha, Alex and Matthewinundated many parts of El Salvadorduring the course of the year. Most of the country's bean crop was lost, causing the price of beans to soar. Many corn fields were also impacted. A tragic accident put a human face on the food crisis, when a father accidentallypoisoned his familyas their hunger led them to eat insecticide-treated seed corn. Bus burning in Mejicanos. All of El Salvador was shocked on June 20, 2010 as the country's violence took a horrifying turn. In Mejicanos, a suburb of San Salvador, gang members shot at a micro-bus of Route 47, then doused it with gasoline and set it on fire. Sixteen people were burned to death in the bus. The massacre embodied the worst fears of Salvadorans stemming from one of the highest murder rates in the world. The number of murders committed in El Salvador declined 9.1% in 2010 from its peak level in 2009. In 2010 there were 3985 violent deaths, 397 fewer than the total of 4382 in 2009. Translated differently, there was an average of 11 murders per day in El Salvador during 2010. This reduction in the murder rate resulted in Honduras pulling into a statistical tie for the highest murder rate in Latin America. The murder rate in Honduras is 72.8 per 100,000 inhabitants, while the rate in El Salvador is 71. (Both rates are significantly higher than the homicide rates in Iraq and Afghanistan, 18 and 14 per 100,000 respectively). The World Health Organization says any rate above 10 is an epidemic. According to statistics from LPG, 3420 murder victims were men and 562 women. Guns were overwhelmingly used in the commission of murders: 3923 of the 3985 homicides were the result of a gunshot.